THE SOUL of Broadbeach will once again groove with unmistakable rhythm for the sixth annual Broadbeach Jazz Festival this weekend. An expected crowd of more than 20,000 people will descend upon Broadbeach to enjoy free jazz music over three days and nights. Headlining this year is the award-winning musician Rhonda Burchmore and Australian vocalist, saxophone player and song writer, Grace Knight. Other artists announced for the festival include Galapagos Duck, Ingrid James, The Simontologist, Tatu Rei, The Royal Jellies and many more. Broadbeach Alliance CEO, Jan McCormick said the organisation is incredibly proud to deliver such an amazing calibre of entertainment, whilst remaining completely free to attend. 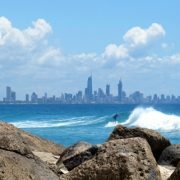 “What makes the Broadbeach Jazz Festival so unique is that you can stay for the weekend and soak up the incredible atmosphere from your balcony, or grab a table at one of the many restaurants, it is all within walking distance and you will never miss a minute of the action.” She adds. The Oasis Shopping Centre will be celebrating it’s 25th birthday during the event by giving patrons the chance to win a trip for two to the ‘home of Jazz’ – New Orleans. See oasisshoppingcentre.com for full details.